This page describes a few modern orders of knighthood, which are either recreations of specific medieval orders, or imitations of medieval or monarchical orders without specific reference to any one. The term "bogus" is one I don't like, because it was so abused by Arthur Fox-Davies, who thought that any arms which were not delivered on parchment by a royal official were "bogus"; thus relegating 90% of heraldry into inexistence. As far as I am concerned, there is no good reason why anyone could not create "orders of chivalry" today; how seriously such associations would be taken will depend on many factors, such as their membership, stated goals and veritable activities; but also on what they claim to be. Only people who would reject as "bogus" any such organization might be offended by the choice of certain orders. I discuss the general question of legitimacy of orders separately. I discuss two kinds of orders, revived and recently created. I use the term revived to refer to associations which call themselves orders of chivalry but are the only ones to do so, and which also claim to be identical with or directly emanated from well-defined historical orders of chivalry. I discuss here a few, sometimes entertaining examples of associations which have sprung up in the past. In some cases, like Lazarus or the British Order of Saint-John, the origins are what they are, but the orders have, to a large degree, transcended them. By recently created orders I mean institutions which call themselves orders of chivalry, and imitate in their general appearance (name, style, insignia, activities) well-known orders or monarchical orders, without claiming to be the continuation or revival of any specific historical order. Guy Stair Sainty also discusses a large number of self-styled orders (including many not mentioned here) on his Web site (and he predictably disagrees with my placement of the Most Venerable Order on this page!). A note: in the references, I have listed all documentation that I have found mentioned in various bibliographies, but I have had access to a small portion only. Those books I did consult are marked with an asterisk. I thank James Algrant and Guy Sainty for helpful comments, although the opinions expressed here are mine only and do not engage their responsibility. The abrupt and dramatic end of the Order of the Temple in 1312, and the execution at the stake of its last Grand-Master Jacques de Molay in 1314, created the right conditions for future claims of resurgence. A similar phenomenon has occurred in the past with dynasties: the various impostors Czar Dimitri Ivanovich in 1605, the various people claiming to be Louis XVII (the most famous being Naundorff), the woman who claimed to be Anastasia daughter of the Czar Nicholas II, etc. In Spain and Portugal, the surviving Templars were regrouped into new orders founded by the sovereigns. Elsewhere, the Templars endured various fates, but the organisation itself disappeared, its leadership killed, its assets confiscated and turned over to the Hospitallers of Saint-John. In the 18th centuries several legends emerged, claiming that the Templars had in fact survived as an order. Jacques de Molay, on his way to death, had allegedly appointed someone as his successor and entrusted him with perpetuating the Order in secrecy. That successor is variously named as the preceptor of Auvergne (who fled to England but died there in jail) or an English knight. The successor is said to have gone to England or Scotland and found refuge among the mason guilds. Thus the secret traditions and knowledge of the Templars (acquired in the East, of course) were passed on to the masonic associations. Not surprisingly, these legends appear at the time when freemasonry is created in England and Scotland, in the early 18th century. Knights Templars became a grade in some forms of free-masonry in the mid-18th century, and it seems that an offshoot of that grade became an order in the US and Canada in the late 19th century (see Land, Robert Ernest Augustus: Fifty years in the Malta order. Toronto, 1928). One particular revival occurred in 1804. Two French masons, Philippe Ledru (1754-1832) and Bernard-Raymond Fabré-Palaprat (1775-1838) found the Order of the Temple, and Fabré-Palaprat is made its grandmaster. Napoleon I, who viewed freemasonry favorably, allowed them to carry on their activities, including solemn processions in the streets of Paris (albeit in modern attire with mantles and toques). Later, in 1815, Sir William Sydney Smith (1764-1840) linked up with these neo-Templars. As admiral of the British navy he had successfully defended Acre against Napoleon in 1799, and supposedly was given by the Greek archbishop a Templars' cross (left in Acre by Richard Lionheart) in gratitude. This cross opened the doors for Sir Sydney who became a Templar and tried to create a branch in England, for which he was made Grand-Prior. His aim was to send the order to participate in the liberation and pacification of Greece and other areas under Ottoman control. He also dreamed of establishing a base in Malta and taking over the old activities of the order of Saint-John (since Malta was then in the hands of the British). He managed to get Augustus-Frederick, Duke of Sussex (1773-1843) interested in the project. The duke of Sussex (6th son of George III) became Grand Prior of England. Another individual active in the revival was Charles Tennyson d'Eyncourt (uncle of the poet Alfred Tennyson). On the death of Fabré-Palaprat Smith became Regent of the order, but his subsequent death soon followed by that of the duke of Sussex dissipated the order in England. D'Eyncourt himself lost interest and resigned from the order in 1849. The French branch seems not to have outlived its founder. In the 20th century, pseudo-Templars proliferated. They are chronicled in Chaffanjon anf Galimard-Flavigny. * Malcolm Barber (ed): The military orders : fighting for the faith and caring for the sick Aldershot, Great Britain, 1994; Variorum. Manuel des chevaliers de l'Ordre du Temple. Paris, 1817 (2d ed. : 1825.) The manual of Palaprat's French order. This order was originally founded as a purely religious order in in Acre in 1190, probably by Richard Lionheart. It was devoted to Saint Thomas Becket, and retained an English character throughout its history. In 1228, Peter des Roches, bishop of Westminster, reorganized the order into a military monastic order on the model of the Teutonic Order. The order did not play a major military role, and after the fall of Acre in 1291 it retired to Cyprus. Sometime in the 1370s the order was moved to its London house. There it survived as a mainly hospitaller order until it was dissolved along with other orders in 1540. At what time it was revived I do not know for sure. It appears again in the early 18th century in Jacobite circles, and was one of several organizations active in promoting the Jacobite cause. It seems to have been under the protection of the exiled Stuarts in France. George Keith, Earl Marischal of Scotland (1692-1778) was its Grand Master until he transferred the office to Seignelay de Colbert Traill, younger son of Laird Castlehill and bishop of Rodez. Later we find Sir Robert Strange as its Grand Master, and in 1848 Lord Elphinstone (1807-60). At some later point Bertram, 5th earl of Ashburnham (1840-1913) is Grand Master, succeeded in 1908 by Melville de Ruvigny (1868-1921). Other Jacobite orders or associations include the Realm of Sion and the Order of Sangreal. In 1848 Henry Lascelles Jenner, bishop of Dinedin in New Zealand, founded the grandly named Sovereign Sacred Religious and Military Order of Knights Protectors of the Sacred Sepulchre of Our Lord Jesus Christ and of the Most Holy Temple of Zion, which was later merged with Sion and Sangreal into a "federal chivalric condominium" called the Sovereign Order of the Realm of Sion. * Alan Forey, The Military Order of Saint Thomas of Acre, in the English Historical Review (1977), 92:481-503. * Roger Ararat, Preface to Ruvigny: The Jacobite Peerage. 1914. See the official site of the US priory, with links to an in-depth history of the order. What follows is my personal interpretation. This Victorian invention has its origins in the turmoil of the Napoleonic era. Following the capture of Malta in 1798 and the conquest of most of Europe by Napoleon, the Order was quite disorganized in 1814. The return of the Bourbons to France prompted the formation of a "capitular commission" of the French langues by an assembly of French knights in May 1814, which was initially recognized by Louis XVIII, and approved by a papal bull of August 10, 1814. It began lobbying for a return of the Order's French properties, and acting at the Congress of Vienna for a return of the island of Malta. Camille de Rohan was head of the commission, followed in 1816 by Lasteyrie du Saillant and later by Jean-Louis de Dienne. It failed to persuade Britain to return the island, but it obtained French government pensions for the professed knights (about 90 survived) and worked on the return of the estates, which seemed possible if the Order regained its territorial sovereignty. Offers of Elba from the Austrian government were rejected because Metternich demanded control of the Grand-Mastership. The search was on for some vacant island. The French Commission, then controlled by its Chancellor Pierre-Hippolyte de Sainte Croix-Molay, then turned to the possibility of helping the Greeks in their war of independence, and a treaty was signed between the Commission and the Greek rebels in June 1823. The treaty promised the order several Greek islands and Rhodes (should it be conquered), and in exchange the Order would raise troops and 10 million Francs. To begin the process the Comission started making knights rather indiscriminately, at least 200 in the space of a few years. But the treaty was opposed by other Greek rebel groups, as well as England and Austria. Under international pressure the French government withdrew its recognition of the Commission and henceforth acknowledged only those knights which had also been authorized by the Lieutenancy of the Order in Messina. (In fact, a royal ordinance of April 16, 1824 stated that only the French royal orders were legal in France, and bearers of foreign orders needed authorization from the government; an instruction of the Chancery of the Legion of Honor of May 5, 1824 provided further details). The Lieutenant of the Order dissolved the commission. The floatation of the loan in the form of bonds on the London market collapsed before it started. The Commission nevertheless revived itself in 1826, under the presidency of Calonne d'Avesnes but still controlled by Sainte Croix-Molay, and continued in its attempts at raising money for its Greek operation. At this time it was totally unofficial, disavowed by the Order of Malta and unrecognized by the French government. The Commission decided to search private sources of funds in England, and opened negotiations with a Scot called Donald Currie, an acquaintance of Sainte Croix-Molay. In 1827 Instruments of Convention were signed between the Commission and Currie, enabling him to raise L240,000 by recruiting new members (even non-Catholics). Currie did not raise much money but he recruited avidly. Greek independence having been achieved without any participation of the Order, Sainte Croix-Molay now turned to the possibility of settling in Algeria, conquered in 1830 by the French. But the same year Charles X was overthrown, and the Commission lost all influence with the French government, which also broke diplomatic relations with the Lieutenancy in Messina. Nevertheless the Commission continued to encourage the formation of an English Langue, which took place in January 1831, with the election of Sr Robert Peat, Bart, former chaplain of George IV, as "Prior ad interim of the Tongue of England". However, a split amongst the British members occurred the next year. By 1837, the party which the French Commission had recognized had more or less disappeared, and the other party led by Robert Peat continued on its own. Peat was succeeded by Sir Robert Dymoke in 1838, Lt-Col. Sir Charles Montolieu Lamb, Bart, in 1847, Rear-Admiral Sir Alexander Arbuthnot in 1860. The English group made contact again with the French knights in 1838, only to learn that Sainte Croix-Molay was considered a disreputable and disavowed character. The English group nevertheless tried to negotiate recognition from the Lieutenancy, who replied that they could not accept non-Catholics. The English also sought the patronage of the duke of Sussex, who turned them down in 1839. The English group almost disappeared, but, led by Sir John Broun, it persisted in hoping for recognition, basing themselves on letters patent of 1557 recreating the order in England (although it was abolished again by Elizabeth I in 1560). Now called "the Sovereign and Illustrious Order of Saint-John of Jerusalem: Anglia", it made contact again in 1857 with the Lieutenancy of the Order in Rome, through a Catholic member of the English group, John James Watts. Negotiations started, with the aim of establishing a Catholic priory, which in turn would form a Protestant branch (the existing group, of course). The Lieutenancy was initially favorably disposed, but the three English knights of Malta, led by Sir George Bowyer, and including John James Watts, who had just been received as members and were to form the Catholic priory decided to break off with the English group instead. A British Association of the Order of Malta was to be founded in 1876. The English association nevertheless persisted in its efforts at some kind of recognition. It enlisted the support of the 7th duke of Manchester who became their grand prior in 1861. The group drew up a Constitution in 1871 and renamed itself more modestly "Order of Saint-John of Jerusalem in England". A corps of ambulances was created in the 1860s, roughly around the same time as (or preceding) the real Order of Malta's charitable activities and those of the Red Cross. The Princess of Wales became Lady of the Order in 1876, and she in turn secured the membership of the Prince of Wales. The priory finally received a royal charter in 1888, which changed its name to The Grand Priory in the British Realm of the Most Venerable Order of the Hospital of Saint-John of Jerusalem, and made the sovereign of Great Britain its Sovereign Head and Patron. The Prince of Wales was appointed Grand Prior in 1890 by Queen Victoria, and since then the Prior has always been a member of the royal family. This royal charter changed the nature of the order. It now enjoys official recognition in Great Britain, and is indeed a British order of chivalry (albeit one with a peculiar status, totally independent of the government, and the only one conferring neither precedence nor use of the title "Sir"). That is an advantage that few orders, self-styled or otherwise, possess. This, however, changes nothing to the origin of the order: it started as a 19th century revival of a defunct organization, the English branch of Malta, abolished in 1540 by Henry VIII. The desire to represent the Venerable Order as the heir to the historical Order of Saint John is evident in the Librarian of the Order's work, Edwin James King's The Knights of St. John in the British realm: being the official history of the Most Venerable Order of the Hospital of St. John of Jerusalem (continued after King's death in 1952 by Sir Harry Luke), published in 1967 in London by the Most Venerable Order of the Hospital of St. John of Jerusalem. This was the 3d edition of E. J. King's history of the Venerable Order. The book studies the Priory of the historical Order until its abolition in the 16th century, and describes the organization since 1831 as a "revival" which received "official regonition" (not existence or legitimacy) from the charter of 1888. He writes, for example: "[In 1871] So far the Order of Saint John had succeeded in re-establishing itself in England and in reviving certain of its ancient dignities (p. 144) [...] The knights of Saint John were now to receive their official recognition in the form of a Charter from Queen Victoria [...] Queen Victoria's charter expressly defines the continuity between the original Grand Priory and its revival in these words: 'The Grand Priory of England is the Head of the Sixth or English Language of the Venerable Order of the Hospital of St. John of Jerusalem'" (p. 149). Among many other examples, one can cite Appendix F of the book "On the seals of the grand priory", which shows "the ancient seals" (until the 16th c.) and "the modern seals" (since 1831); this is not innocuous, since in English law corporate seals are the legal mark of identity. But Queen Victoria cannot make the Venerable Order into what it cannot be: it cannot be "the Priory in Great Britain" of the Order of Saint John of Jerusalem, because the latter is a Catholic order with its own British association, and the Queen of Great Britain does not have the power to create priories of that order. The language of the 1888 charter is even more jarring: by calling the new order "the sixth or English language" a clear reference was made to the historical Order of Saint John, in which, until the reorganization of the 19th century, the knights were grouped in Languages or Tongues, and England was the 6th. Before and after its transmutation into a British order of chivalry, the order has used a name (Order of the Hospital of Saint John of Jerusalem) which belongs, or is a purposeful imitation of a name which belongs to another institution. The aim of such use is to assume some of the historical prestige and legacy of the historical order of Malta: self-styled orders do no less. who became its Sovereign Head. Sovereign Order nearly one thousand years ago. the sufferings and miseries of mankind. Notice that the issue of legitimacy and recognition is skirted adroitly; in particular, the Order of Malta does not recognize the British Order to be "the" Order of Saint John, as its name implies. What one can conclude from this, is that, from Malta's point of view, the British Order is worth collaborating with for purposes of charity, and questions of legitimacy and usurpation of name are secondary. Few other orders enjoy this form of recognition. To this day, members of the Order of Malta are also members of the British Order (as was, e.g., Mgr Bruno Bernard Heim), as good a sign of reconciliation as any. *King:, Edwin James: The Grand Priory of the Order of the Hospital of Saint-John of Jerusalem in England: a Short History. London: Fleetway Press, 1924. King, Edwin James: The Knights of St. John in the British empire; being the official history of the British Order of the Hospital of St. John of Jerusalem. London: St. John ambulance association, 1934. *King, Edwin James: The Knights of St. John in the British realm: being the official history of the Most Venerable Order of the Hospital of St. John of Jerusalem. (3d. edition, continued by Sir Harry Luke). London: Most Venerable Order of the Hospital of St. John of Jerusalem, 1967. * Henri de Pierredon: Histoire politique de l'Ordre Souverain de Saint-Jean de Jérusalem: (Ordre de Malte) de 1789 à 1955. Paris, 1955; Ed. Scaldis. Saint Dominic founded an order by that name in 1216; but it was not an order of chivalry, and it did not survive very long. The modern revival began, innocently enough, in 1870, after the capture of Rome by Italian troops. Former members of the Papal army, under the comte de Beaumont, decided to found an association which would fight for the rights of the Holy See and stand ready to assist it against its enemies. The name of the association was Milizia di Cristo, crociata di preghiera e di azione (Militia of Jesus-Christ, crusade of prayer and action). This society, which admitted women, was organized in sections headed by "promoters," and was placed under the spiritual guidance of the Dominicans. Its name recalled the Militia of Jesus-Christ founded by Saint Dominic in 1216, although no claim to be a continuation of that institution was made. The Dominicans looked favorably on the new institutions, affiliating its members with the Third Order of the Dominicans. The comte de Beaumont merely called himself Organisateur de la Milice de Jésus-Christ pour la défense du Saint Siège, and the cross worn by members consisted simply of a cross potent argent with a medallion in the center. One day things changed abrutply. On the occasion of the funeral of the French admiral Courbet in 1885, a Paris newspaper, L'Univers (Aug 30, 1885) mentioned the presence of a representative of the Militia, and asserted that "the Militia [was] a religious and chivalric order founded by Innocent III and Saint Dominic, and Pius IX had appointed the comte de Beaumont as Grand Master of the Order in France". The General of the Dominicans, Padre Larroca, was rather surprised, and made inquiries. He discovered that the comte de Beaumont had retired and been succeeded by Domenico Piccoli, who started calling himself Lieutenant General and Grand Prior of the Cross of Paris of the Order. The Order was renamed Ordine religioso cavalleresco della Milizia di N.S. Gesu Cristo, its members calling themselves knights and commanders, wearing a uniform with white jacket, and the shape of the insignia had become the black and white cross flory of the Dominicans. Alarmed, the General of the Dominicans wrote to Piccoli and informed him that all links between the Dominicans and the Militia were severed, and asking him to stop using insignia related to those of the Dominicans. His successor also wrote to Piccoli in 1888 telling him not to use titles such as Lieutenant-General or Grand-Master, since theirs was an association, not an order. Some years later, Piccoli made another attempt at obtaining official endorsement, and received a reply from P. Cormier, Procurator General of the Dominicans, once again refusing to have anything to do with the Militia (1897). Badges of the Militia of Christ. Source: By courtesy of Hermann Historica, Munich. At this point, Piccoli turned elsewhere for patronage, and persuaded the Melkite Catholic patriarch of Antioch, Peter IV, to become Grand Master, in 1900. Peter IV died in 1902, and the Mastership was offered to his successor Cyrill VIII, who immediately wrote to the Pope for his approval. The Holy See's reaction was swift. In 1904, the Secretary of State of the Holy See wrote to Piccoli to inform him that the Order of the Militia of Christ was not approved by the Holy See, and that Cyrill VIII would not accept the Mastership. In the end, Piccoli assumed himself the Grand Mastership of his order. He died in 1916, but the association seems to have survived him; and it was still in existence in the 1970s. Some members of the Militia, however, went on to found other revived orders. In particular, Paul Watrin, knight of the Militia in 1902, founded in 1910 a revived order of Saint Lazarus and placed it under the protection of the same Melkite patriarch in the same year. * Alberto di Montenuovo: article in Rivista Araldica, 1916, pp.364-7. Piccoli, D. Constitution de l'Ordre de la Milice de Jésus-Christ. Paris, 1887. Piccoli, D. Histoire de la chevalerie, des croisades et de l'Ordre de la Milice de Jésus-Christ depuis leur origine jusqu'à nos jours. Paris, 1905. Bertrand, Paul. L'ordre de la Milice de Jésus-Christ, de Saint-Dominique et de Saint Pierre Martyr. Paris, 1938. (I have not seen this book; the author is the official chronicler of the revived order of St Lazarus). This noble confraternity, known in English as Saint George of Burgundy, was founded in 1390 by Philippe de Mollans, a nobleman from Franche-Comté or comté de Bourgogne. A tradition claims that he made a pilgrimage to the Holy Land and brought back a relic of Saint George. Soon after he founded the Order in question. Its statutes are known: members had to prove 16 quarters of nobility and 10 degrees of nobility in male line, be natives of Franche-Comté, Catholics and 16 or older, and pay 300 livres. A governor was elected for life; other officers included a chancelor (a cleric), a treasurer and two secretaries. Assemblies were held every year. The society lapsed but was revived in 1485; it swore allegiance to Philip II of Spain in 1569, expelled a Protestant in 1584; it stopped meeting during the Thirty Years War but resumed after 1648, and met yearly in Besançon. The arms of the order (Gules Saint George or) were registered in 1696. In 1768 the statutes were revised. Many of the order's members emigrated or died during the Revolution, and it had only 25 members in 1814. In 1816 the survivors regrouped under the leadership of Charles-Emmanuel, marquis de Saint-Mauris (1753-1839), baron-pair in 1828, of an ancient local family that had counted many members of the order (R�v�rend, vol. 6, p. 194). The statutes were revised to allow for speedy reception of siblings and children of former members, and other receptions brought the order to 78 in 1817, date of the last reception of members. But the order was abolished in 1824 when an Royal ordinance of April 16, 1824 made it illegal to wear decorations and insignia other than those of the Royal orders. An instruction of the Chancery of the Legion of Honor of May 5, 1824 specifically cited the Order of Saint George as abolished. No knights were subsequently received. The last knight, the marquis de Jouffroy d'Abbans, died in 1869, at which point the Order became extinct. In the Biblioth�que nationale, collection Clairambault, are two volumes on this order: 1318 contains printed material, 1319 contains a list of members from 1575 to 1703. The insignia of the order was a medallion showing Saint George killing the dragon, hung from a ribbon, initially red (with the approval of the duke of Burgundy Philippe le Bon), changed to blue under Louis XIV. There exists a book on this order or confraternity: La Noble Confr�rie des Chevaliers de Saint-Georges by Eric Thiou. Badge of St. George of Burgundy. Source: By courtesy of Hermann Historica, Munich. The revived order followed a worn pattern. In a typical fashion, it was claimed that the order was actually founded in 1167 in Palestine by Roger, bishop of Arimathea, brought back to France around 1300, reinvigorated in 1390 by Philippe de Mollans. Supposedly, it was not abolished in 1824 but survived until 1880, when, allegedly, new statutes were given to it. It only really surfaces in the 1920s, when it is headed by a Grand Referendary named the comte de Maupas (false title of comte, non-noble family name changed from "Maupas" to "de Maupas" in 1853; Dioudonnat, p. 447). Maupas was succeeded in 1923 by a marquis de Golbery (another false title) and in 1926 replaced by a General Government assisted by a Sacred Council headed by a duc de Lavillatte (yet another false title). In 1929 Francesco Antonio di Gonzaga di Mantua was elected Governor of the order, and revised statutes of the Apostolic and Hospitaller Order of Saint George and Notre-Dame du Mont-Carmel were published. The new order was rather different in spirit: the nobility requirements were dispensed with, the exclusion of non-Catholics was relaxed, and recruitment extended outside of Franche-Comté. The name "Notre-Dame du Mont-Carmel" was added, based on the claim that knights of the French order of Notre-Dame du Mont-Carmel had merged their order with that of Saint-Georges (never mind that N-D du Mont-Carmel was never an independent order, but merely a duplicate of Saint-Lazare). The same year, the French Association of the Knights of Saint George was registered as a non-profit association under French law (14 Mar 1929). In 1931, the order in question dropped any reference to Notre-Dame du Mont-Carmel... By 1934, the Order of Saint-Georges claimed the membership of the French generals Weygand and Gouraud, as well as 3 Italian generals and 3 American generals. It found an ardent supporter in Adriano Colocci-Vespucci, who wrote several articles in Rivista Araldica (1934, p.562-7, 1935 p.61-63). An article by A. de Rubeis (Rivista Araldica, Feb 1938, pp.79-83) lists other eminent members: the archduke Franz-Josef of Habsburg-Lothringen, the archduke Ferdinando of Lorraine-Tuscany, prince William of Wied (king of Albania in 1914), the French general de Castelnau, the admiral Dartiguez, the vice-admiral de Neresteny, the presidents of Venezuela, Peru, Cuba, the Prime Minister of Czechoslovakia, two cardinals, Victor Dowling (New York Supreme Court), etc. Note that Dowling was also a knight of Saint-Lazarus. One of the individuals involved was an orthodox priest, the archmandrite Demeter de Ser Leo (already connected to the contemporaneous revival of Saint Lazarus, of which he was a member). He was tried in November 1937 by a military court in Rome and found guilty (along with two Frenchmen) of illegal sale of decorations; the same court declared the order to have been abolished in 1824 and inexistent. Even worse, the "duc de Lavillatte", a.k.a. "duc de Saint-Simon", whose real name was Philippe Dissandes de Lavillatte (an old non-noble family from the Berry, according to Dioudonnat), was sued for usurping the name of Saint-Simon and for wearing false orders and impersonating a general. The offending occasion, though not the sole one, was his appearance at the funeral of a general at the Invalides on 10 Jan 1934, styling himself "Most Serene Highness general duc de Saint-Simon", wearing the uniorm of an Italian general, and wearing no less than 22 decorations. He claimed that his father had received the ducal title from the king of Montenegro in 1920, and also claimed to descend from the famous writer duc de Saint-Simon (d. 1755). The court sentenced him to a suspended sentence of 8 days in jail, a criminal fine of 500F and a civil fine to the Saint-Simon family of 8,000F (Tribunal correctionnel de la Seine, 9 Dec 1936; Recueil Sirey, 1937, 2:133). Not surprisingly, the order disappears completely after that date, although it is included in the list of false orders condemned by the Holy See in 1953. The parallels with the revived order of Saint-Lazarus are striking: an ancient order which died out in France after 1830, revived in the 1920s (albeit with membership requirements much loosened), with vague claims that it had survived secretly in the 19th century, some of the same individuals involved in both activities, a Grand-Master with an impressive name chosen in 1929, a sudden surge of activity with famous people supposedly becoming members, including presidents of Latin American countries, etc. There appears to be a recent revival of this order by Pierre Pasleau, an habitu� of the false title circuit. Jürgens, G. Storia dell'Ordine equestre di San Giorgio di Borgogna. Roma, 1935. Uyttenhove, J. Ordre souverain de Saint Georges de Bourgogne. Gent, 1960. * various article in Rivista Araldica, cited above. I discussed briefly the prior history of the Order of Saint Lazarus. It was a hospitaller order founded in the 12th c. in Jerusalem to serve as hospital for knights who had contracted leprosy. Since leprosy did not necessarily incapacitate, the hospital acquired a structure modelled on the other military-monastic orders in the Holy Land, and, as manpower grew scarce in the late 13th c., some members were involved in battles against Muslims. After the fall of Acre in 1291, the last remnants of the order moved back to Western Europe, mainly France and Italy. The Pope tried to merge it with the Order of Saint John in 1489, then merged it with the Savoyard order of Saint Maurice in 1572. The remaining French priory, which refused to obey the Pope, was transformed into a French royal order and united with the Order of Notre-Dame du Mont-Carmel in 1608; it underwent many changes and was abolished in 1791. Not restaured in 1814, it disappeared with its last members in the mid-19th century. The Order was revived in 1910 and the organization still exists today. I discuss its modern history in a separate page. The Niadh Nask was a self-described "non-chivalric order of knighthood" which was claimed to have roots in a medieval caste of Irish warriors and to be associated with the MacCarthy family (princes of Desmond until the 16th c.). Evidence of its existence prior to recent times was scant (for example, a cross-shaped badge hangs around the neck of the last prince of Desmond in a 19th century copy of an alleged 16th c. portrait, now lost, and of stylistically dubious authenticity). Its defenders claimed that it had survived until the 1970s as a rather confidential order confined to the MacCarthy family. It considerably extended its public presence under the grand-mastership of Terence MacCarthy, a.k.a. the "MacCarthy Mór". There was substantial overlap in the memberships of the Niadh Nask and the Order of St. Lazarus. In late 1999, what many people had suspected became patently clear: Terence MacCarthy, whose descent from the princes of Desmond was debunked by Sean J. Murphy, was a complete fraud, and had completely invented the Niadh Nask. Elements of this now obsolete controversy can be found in this page. Although bona fide orders have been created out of private initiative for charitable, military or religious purposes ever since the original order of Saint John (now known as Malta), since the 19th century there has been a large number of orders created either to satisfy personal vanity, or to enrich a group of people (or both). Not all recently created orders of chivalry need be condemned by such a blanket statement, but caveat emptor remains the rule. Here are some links randomly collected while surfing the Web (some links may be out of date or broken). Founded in the late 1960s by the head of the Melchite Greek Catholic Church, the Patriarch Maximos V. It has ranks, titles, fees ($1500 for a knight, $11750 for a grand cross), decorations, fancy costumes, investiture ceremonies, etc. Coincidentally, the patriarch is also the spiritual protector of the order of St Lazarus. founded in 1976 by the metropolitan of the Antiochian Orthodox archdiocese of North America, with the blessing of the Antioch patriarch Elias IV. of the Ecumenical patriarchate of Constantinople was founded in 1966, with Pierre DeMets as Grand Commander. This self-described "ecclesiastical order of merit" made a brief appearance on the Web; it is apparently tied to the Orthodox bishop of Milan. Its badge is a stunning likeness of the badge of the Constantinian Order of St George of the Two Sicilies. Its recognition by the ICOC is said to be pending. There are two associated orders, the Supreme Order of St. Ambrosius and the Orthodox Order of Saint Mary Magdalen at the Holy Sepulchre of Christ. Created by Lloyd Worley, a professor of English at the University of Northern Colorado (and also count palatine of Mazalla, courtesy of the "house of Alabona-Ostrogojsk", see below). Created by William Maszer, a.k.a. "His Royal and Serene Highness Prince William I de Alabona-Ostrogojsk-Garama". an invention of "Prince Michael Stewart of Albany"
This title peddler (be a duke for $1500!) 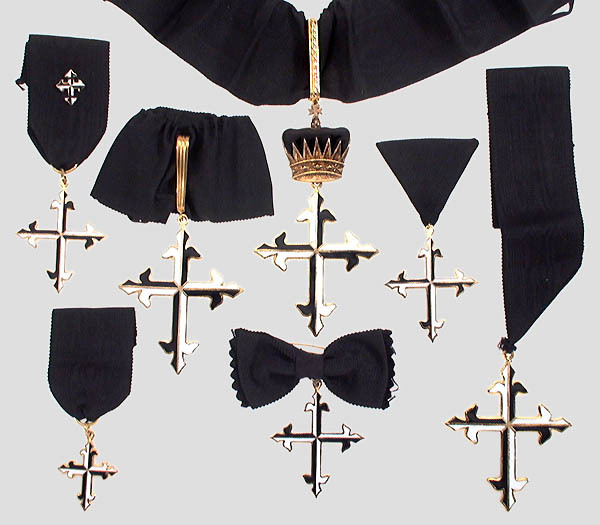 also confers the "Order of Saint Andrew of Jerusalem". Dukes get the "Order of St. Victor" for free. I include here a bibliography taken from Ivo Suetens: Bibliographie Numismatique: Ordres et Décorations, Bruxelles, 1969, 1977. I have not seen these books, and it is likely that they are quite rare, many of them being 16-page pamphlets without place or date of publication. But the list is, of itself, instructive, as it provides traces for the activities of these orders over time. See also the list of fantasy orders established by the Italian Foreign Ministry and another list drawn by the Holy See in 1953. Some general sources on self-styled orders. Gillingham, H. E. Ephemeral Decorations. New York, 1935. American Numismatical Society: Numismatic Notes and Mongraphs 66. Chaffanjon, Arnaud and Bertrand Galimard-Flavigny. Ordres & contre-ordres de chevalerie. Paris : Mercure de France, 1982. A19th century creation of the so-called prince of Gonzaga-Castiglione, convicted of fraud in 1853. La famille des Gonzagues et l'Ordre de la Rédemption du Précieux Sang. (mid-19th c.). Villamora, A. de. Notice historique des ordres de chevalerie appartenant a la maison royale des princes de Gonzaga, ducs de Mantoue. Lyon, 1863. Marseille, 1866. In 1880, a former Maronite priest named Kafta and his wife started peddling an Order of Melusina, claiming to represent the royal house of Lusignan (which reigned over Cyprus in the 13th to 15th centuries) and calling themselves Guy and Marie de Lusignan. After his death, her lover became Grand Master and called himself comte d'Alby de Gratigny, but became involved in a fake art intrigue in 1910. Lusignan, M. de. 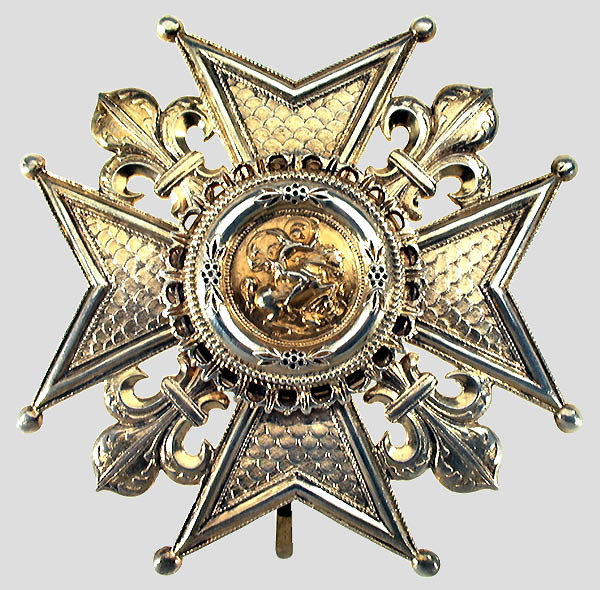 Ordre de Mélusine, chevalerie d'honneur de Marie de Lusignan. Paris, 1888. Lusignan, G. de. Statuts de l'Ordre royal de la Saint Catherine du Mont Sinaï. Paris, 1896. Cornaro, F. Reale Ordine di Cipro. S.l., 1948. 16 p.
Pelliccioni di Poli, Luciano Il sovrano ordine di Cipro. Rome, 1973. Gybels, V.G.M. Geschiedenis en Symbolen der Geheime orde van den Gulden Hoorn. Merksem, 1933. Miera, F. de. Statuts de l'Ordre Equestre du Grand Centaure. Verviers, 1872. Created in the 1950s by a cadet of the Sicilian family of Paternò. See more info. Santippolito, C. L'Ordine dinastico di S. Agata dei Paterno. Messina, 1961. Orden de los Caballeros del SS. Salvador o de S. Brigida de Suevia. Estatutos. 1948. Ordine dei Cavalieri del S.S. Salvatore o di S. Brigida di Svezia. Statuti. 1950. Bisogni. La Sacra e nobile milizia del SS. Salvatore o di S. Brigida di Suezia. 1950. Van Dijk, B.J.M. De ridderlijke orden van St.-Birgitta van Zweden en van de Roos en het Kruis van Jerusalem, tempelorde. Amsterdam, 1968. Vargas Machuca, A. de. Il Sacro militare ordine di S. Maria di Bethlemme. Naples, 1936. Founded by Pericles Voultsos in the 1950s, headed now by Thomas John Taglianetti. See more info. Ordre grec-souverain et international de Saint-Dennis de Zante: Histoire, Administration, Buts et activites. New York, 1953. The International American Institute. The story of the ancient and most exalted Greek Order of Saint Dennis of Zante. Washington, D.C. 1958. Historia de la muy antigua e nobre Ordem grega de S. Dionisio de Zante. Lisboa, n.d. A Spanish version, printed in Santiago de Chile, ca. 1960. C.N. Packett. The story of the ancient and most exalted Greek Order of Saint Dennis of Zante. Bradford, 1962. The Sovereign Greek Order of Saint Dennis of Zante. Historical summary and roster. New York, 1965-. Voultsos, P. Hoi hippotai tou hagiou Dionusiou Zakunthou. Athens, 1973. Revived in the mid-20th century; seems to be still active. Pelliccioni di Poli, Luciano: L'Ordine di San Giorgio in Carinzia. Rome, 1975. Another edition in 1983 with slightly different title: L'Ordine Sovrano Militare Ospedaliero di San Giorgio in Carinzia. On the cover of the first edition the author is styled "conte di Montecocullo, Gran Cancelliere dell'Ordine". A nobiliary confraternity of this name did exist in Old Regime France, similar to S. George of Burgundy. Like it, it was revived in the 20th century by Ernest-Diomede Caprotti during World War II; its chancellor was a Dutchman, Charles J.A. Begeer. This order had as its head a prince Galitzin and later Eugene-Leopold of Bavaria (cf. Zeininger 1953). Caprotti, D. Capitularis Ordo Sancti Huberti Lorenensis ac Barensis e pia Unione dell'Ordine di S. Huberto. Florence, 1944. Originally a crossbow practice group of the 15th century, briefly revived in the 1730s. Recreated by L. Doucet inthe 1900s as a pseudo-nobiliary order with Grand-Cross, Commander, Officer and Knight. The insignia was a Maltese cross with two arrows crossed between the branches and surmounted by a countal coronet. Doucet de Chermont, L.M. Documents, statuts et privilèges de la noble institution de l'Ordre des Chevaliers de Saints-Sébastien et Guillaume. Montligeon. 1911. Breve Historia da ordem dos Cavalheiros de S. Sebastiao e Guilherme. Rio de Janeiro, 1954.
article by Ugo Orlandini in Rivista Araldica, October 1910, p. 624. A creation of "Flavian Eugene, 47th duke of Athens". (Cf. Zeininger 1953). Sanz de Andino, F. J. La Orden de Constantino el Grande y de la Real Corona de Vandalia. Madrid, 1947. One of the creations of Fortuné Koller, who also served as propagandist for the Belgian G. Proot, so-called prince of Thomond. Koller, Fortuné. Ordre sacré impérial angélique de la Croix de Constantin le Grand. Rome, 1950. Ajtay de Vajasd, L. L'Ordine della Mercede. Rome, 1914. Vico, A. Costituzioni del celeste, reale e militare Ordine di N. S. della Mercede. Rome,. 1926.